With each new wave of technological innovation, the traditional way to explore the evolution of the educational model is to focus on how to best integrate the new technology into the learning process without influencing the traditional pedagogical principles and policies imposed by formal educational institutions. Recently, with the rise of new Web 2.0 tools and services (e.g. blogs, wikis, RSS, mashups, social tagging), many researchers are going the same way by exploring how to best include these tools into the traditional academic and corporate learning process. I believe however that in doing so, educational Web 2.0 technologies will go the way of previous technologies (e.g. LMS, LCMS, CMS, LO, LOR); i.e. much hype followed by a slow death. Actually, the problem of today´s educational model is a culture problem rather than a technology one. Mejias states that in the past couple of decades, we´ve heard about the potential of e-learning to transform the way we learn. Despite isolated achievements, the success record is on the whole not very encouraging. In my opinion, failures in the traditional educational model mainly result from the fact that we are trying to solve new problems with old ways that would not work in the new global competition era. In an earlier post, I pointed out that we need a fundamental shift toward a more social, personalized, open, dynamic, emergent, and knowledge-pull model for learning, as opposed to the one-size-fits-all, centralized, static, top-down, and knowledge-push models of traditional learning initiatives. I suggest here a new educational model that goes beyond the traditional classroom and educational institution boundaries and presents a new way of thinking about teaching and learning. This model is similar to the Hollywood industry model where different contributors come together for a particular film or show; they work together until the project is complete; they do not have a "permanent" relationship with a studio or entertainment company. This new educational model is based on personal environments, loosely joined. Personal Learning Environments (PLE) and knowledge networking are the cornerstones of this model. A PLE is characterized by the freeform use of a set of lightweight services and tools that belong to and are controlled by individual learners. Rather than integrating different services into a centralized system, the idea is to provide the learner with a myriad of services and hand over control to her to select and use the services the way she deems fit. A PLE driven approach does not only provide personal spaces, which belong to and are controlled by the user, but also requires a social context by offering means to connect with other personal spaces for effective knowledge sharing and collaborative knolwedge creation. PLEs can be aggregated to form a dynamic learning community. Siemens defines a learning community as "external structures that we create in order to stay current and continually acquire, experience, create, and connect new knowledge". The outcomes of a learning community can be reviewed and assessed by experts or other communities. A key requirement here is a new culture that allows knowledge to flow and rewards rather than punishes collaboration initiatives. Collaboration has to become the norm and a meaningful part of the performance evaluation of learners. A learning community might need a person(s) who would just act as a knowledge broker, knowledge co-creator, mentor, coordinator, and facilitator of the learning experience rather than as a traditional teacher. 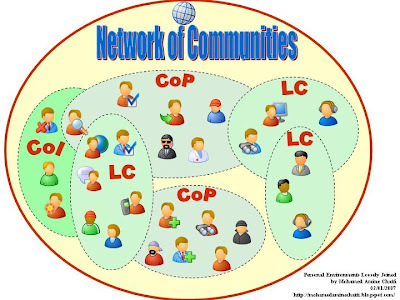 Membership in multiple knowledge communities including learning communities (LC), communities of practice (CoP) and communities of interest (CoI) is allowed. Wenger for example writes that communities are everywhere. We all belong to a number of them. Some have a name, some don't. We are core members of some and we belong to others more peripherally.